Cameron Winklevoss, left, and Tyler Winklevoss, right. “Either Shrem has been incredibly lucky and successful since leaving prison, or—more likely—he ‘acquired’ his six properties, two Maseratis, two powerboats and other holdings with the appreciated value of the 5,000 Bitcoin he stole from” the Winklevoss twins in 2012, the lawsuit says. 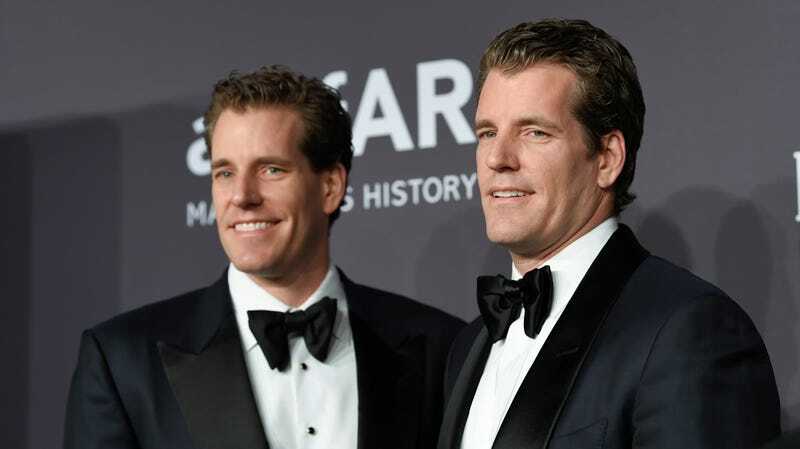 According to the Times, the twins hired an investigator who determined that their bitcoins were transferred onto wallets at the Xapo and Coinbase exchanges belonging to Shrem, and have additionally secured a court order imposing a freeze on those accounts. An affidavit filed as part of the lawsuit additionally appears to indicate that Shrem owes the government nearly $1 million in restitution from his criminal case, the paper added. Since leaving prison, Shrem has continued to work on several cryptocurrency-related projects, including the advisory business Crypto.IQ. “If we don’t have to have that centralized or trusted location, then it removes the ability for hackers to steal our money and our things, it removes the ability for corruption, embezzlement, all these things go out the window,” Shrem added. Correction: Due to a copy-paste error, a prior version of this article briefly referred to the “Winkleboss twins.” Though this was very funny, we regret the error.